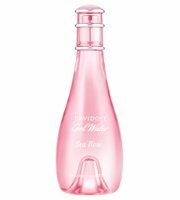 Sea Rose is DAVIDOFF Cool Water’s latest incarnation, exploring a completely new facet of the eternal love story between women and the sea. Tender and delicate, this strikingly fresh fragrance celebrates purity and spontaneity. The Sea Rose woman lives in perfect harmony with the beauty of nature. Fresh and innocent as the new day, deep and wise as the ocean, she is one with the world around her. Cool Water Sea Rose was developed by perfumer Aurélien Guichard; notes include nashi pear, peony and musk. Davidoff Cool Water Sea Rose will be fronted by model Diana Moldovan. I will update with sizes and concentration when I can. Update: Cool Water Sea Rose is available in 30, 50 and 100 ml Eau de Toilette and in matching body products. But no rose in those notes? Still it does sound pretty. I wore CWW back in the day and have some great memories. Well, that’s a darned short list of notes. No idea if it has rose or not. When I first read the name I thought of sea lily (not a lily) and sea cucumber (much grosser than a cucumber), and then sea monkeys (not monkeys in any sense). So “sea rose” could be anything. Or nothing. Cool Water Woman will forever be the scent half the girls in my high school Sophomore class were wearing. I really liked Cool Water Wave, their best one, imo. Sea Rose, I like that name but haven’t liked one scent with pear yet..idk why! I love the scent of a pear..but can’t find one scent I like with that note, lol. I’m not a fan of pear in perfume myself.